In the October 2014 run-off presidential election Dilma Rousseff of the Workers ´ Party (Partido dos Trabalhadores, PT) was re-elected by a small margin of 51.6% of the votes. This also mirrored public disappointment with her economic management as Brazilian GDP growth decelerated. Rousseff´s first action after her re-election signalled a hopeful return to more orthodox macroeconomic policies, i.e. to combat inflation and to trim the budget deficit. In order to regain confidence in fiscal policy and stave off the growing risk of Brazil losing its investment grade rating from the major credit rating agencies, finance minister Guido Mantega was replaced by Joaquim Levy, a well-respected, orthodox economist, who already served under the administration of president Lula and significantly improved government finances at that time. However, since late 2014 the administration and the ruling Workers´ Party have come under pressure due to a massive corruption scandal: state prosecutors alleged leading construction and other businesses paid a huge amount of bribes to high-ranking officials of the state oil company Petrobras and certain politicians, mainly from the Workers´ Party, in return for contracts. Dozens of senior managers of Petrobras and other companies have been arrested in the meantime. Brazil’s large, diversified economy has underperformed since 2011 and even experienced a technical recession in H1 of 2014. 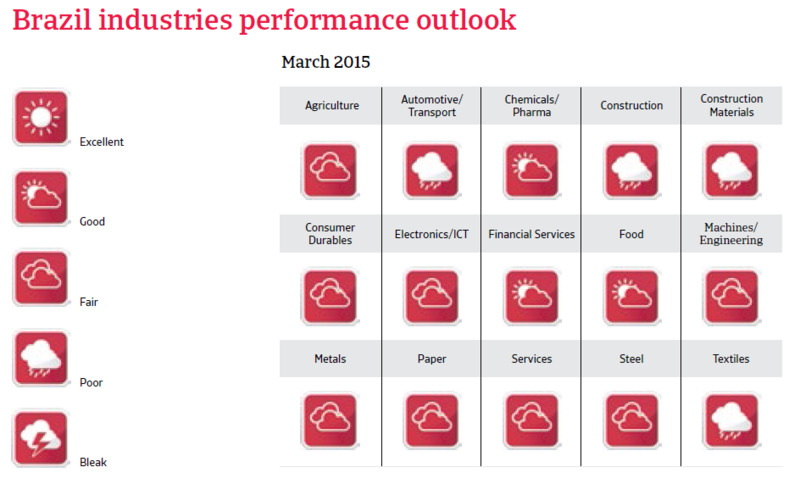 Growth slowed down in 2014, mainly due to weak domestic and foreign demand and decreased commodity prices. Domestic demand has been adversely affected by decreasing consumer and business confidence in response to an unbalanced economic policy mix and increased state intervention under the first Rousseff administration. Additionally major supply side constraints (low investment and savings ratios, weak infrastructure, complex business and regulatory environment) had an adverse effect. 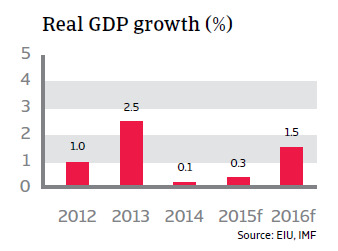 The Brazilian economy is expected to grow only 0.3% in 2015 after 0.2% in 2014, as the much needed return to more orthodox economic policies will negatively weigh on growth in the short-term. Fiscal policy has been quite expansionary in recent years, as investment to exploit the huge offshore oil fields, the 2014 FIFA World Cup and the 2016 Olympics fuelled public sector spending. 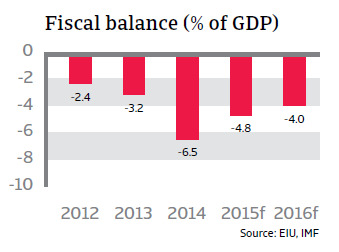 The budget deficit increased to 3.2% of GDP in 2014 and is forecast to increase to more than 6% of GDP in 2015. 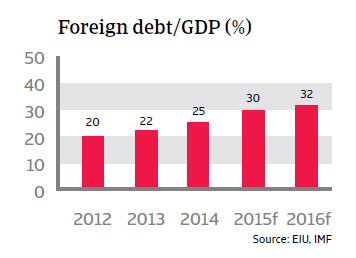 At 63% of GDP, government debt was already fairly high in 2014, and is forecast to increase further in 2015, to 65% of GDP. Most of the debt is domestically financed in local currency at an average maturity of seven years. Private consumption, which is Brazil´s main contributor to growth, is adversely affected by the adoption of austerity measures necessary to restore government finances. The steps have included boosting taxes and regulating prices, which have caused inflation to accelerate again in the short-term. To slow price increases, the Central Bank has raised the SELIC benchmark interest rate (its overnight lending rate) four times since October 2014, to 12.75%, the highest level in more than three years. However, increased interest rates and high household indebtedness hamper private consumption growth and are expected to continue to do so in 2015. Both business and consumer confidence have been negatively affected by the Petrobras corruption scandal, which has severe consequences for the construction and energy industries as well as, due to the scandal, new investments are being put on hold and many companies may face financial difficulties. 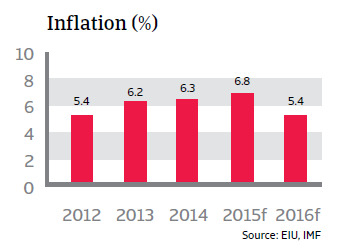 Inflation is expected to remain above 6 % (the Central Banks´s target rate) in 2015. To further combat inflation, but also to prevent a further weakening of the exchange rate, the Central Bank is expected to keep the SELIC at a high level. Growth-enhancing structural reforms - reducing bureaucracy and corruption and improving education - are urgently needed to improve Brazil’s earnings capacity. An expansion of the currently more orthodox economic policy would also help to generate higher growth rates in the long-term. However, it remains uncertain if President Rousseff will continue to support more orthodox policies given that the adjustments will be politically painful. Social discontent over the poor quality of public services, corruption, and the weak state of the economy has already grown. Brazil remains vulnerable to changing investors’ sentiment, due to a relatively high stock of portfolio investment inflows (160% of international reserves). This weakness became evident in mid-2013, when rumours that the US Federal Reserve would end its expansionary monetary policy led to investors withdrawing short-term capital from Brazil. This put pressure on Brazil’s international reserves and exchange rate, with the Real strongly depreciating against the USD. Following a rebound at the end of 2014, in early 2015, the Brazilian real has again come under depreciation pressure. 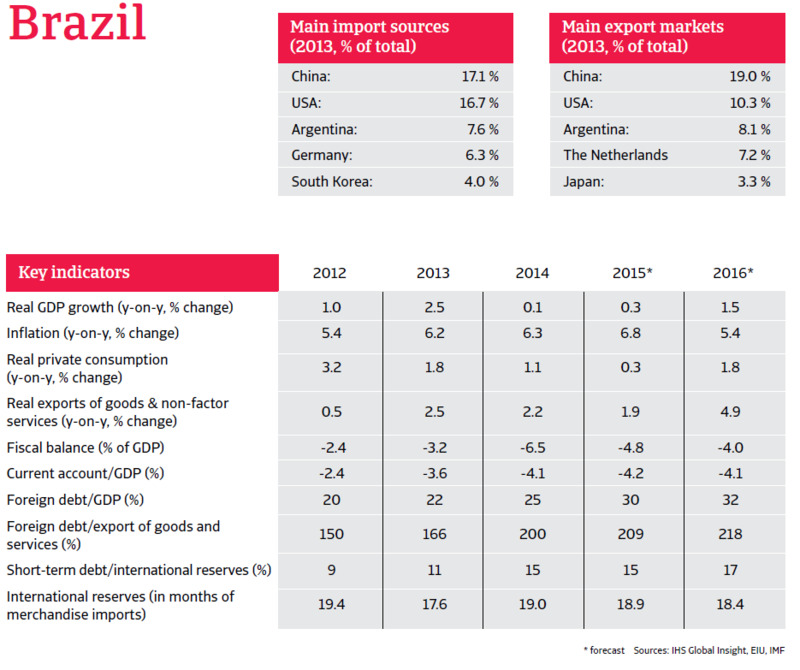 Brazil´s external financial situation is expected to remain strong. External debt is still quite low and liquidity is more than sufficient to cover imports (more than 18 months) and external refinancing needs. 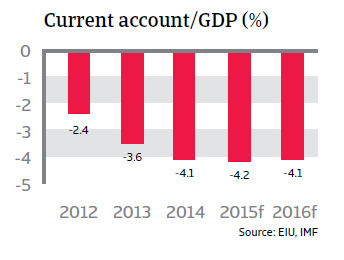 The current account deficit is expected to remain stable in 2015, at 4.2% of GDP as decreasing export receipts are more or less counterbalanced by declining imports. Brazil´s earning capacity is set to improve in the long-term, as there are large offshore pre-salt oil reserves (i.e. located below the deep layers of rock and salt off Brazil’s coast) estimated to be 50 billion barrels. More exploration of these resources could turn Brazil into one of the largest oil-producers in the world. However, this would require large investments in the highly complex and capital- intensive deep water developments. For these to materialise, Brazil would have to improve its business environment.